I have been in the yearly habit of choosing my one word for the year. I believe this started in 2008 or 2009. I’ve chosen words like “trust” and “joy”. My one word for last year was “Steady,” you can read more about it here. As I was considering and praying about our next Online Bible Study, on the heels of a pretty tough month, I was drawn back to “steady.” That reminder has made me so excited for our next Online Bible Study! This month we will be reading, writing, praying, and studying the Book of Colossians! But why steady? And before I explain, yes, I realize this not all about me. I’ve had a terrible, awful, no good month. I have honestly felt completely uprooted in all I know to believe and love. That kind of tough. I also know we are coming into some of the busiest and most attention dividing months left in the year. There are holidays and shopping, and wrapping up the first semester of school, and a major change in season and the mini-Lent like liturgical season of Advent and making plans for the new year–even just writing down next year’s doctors appointments in this year’s calendar…it’s a lot! If you’re feeling that need to settle down in Christ. That need to reconnect with your roots. That need to sink deep into Him and His powerful Word–Join us! Our Online Bible Study Community meets Live at least once a week in our private Facebook group. We pray for each other, we encourage other, and most importantly, we read, write, pray, and study the living and active Word of God together in community. 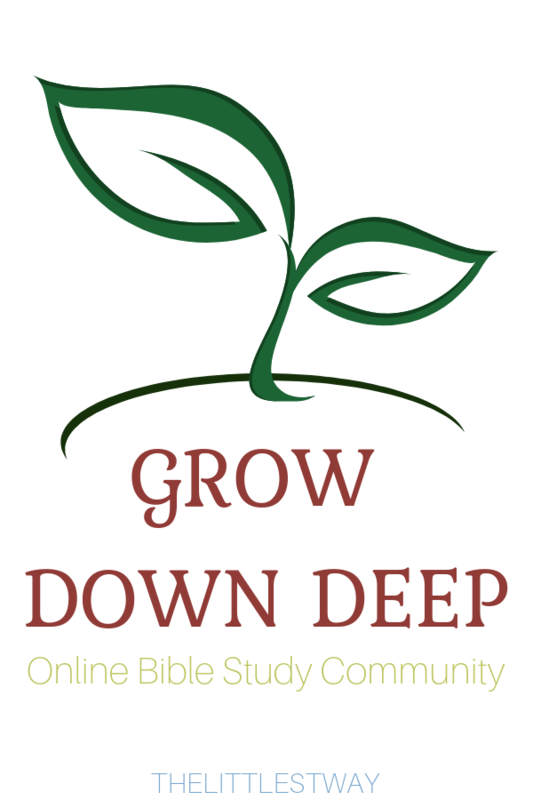 Finally, enrollment in our Online Bible Study Community is only open until the last day of this month! This allows us to all start the new month on the same page, literally. And one more thing, if you are in a season where you feel like you cannot commit to our Online Bible Study Community, I do have the Scripture Writing Plan and Worksheets for purchase as digital downloads in The Littlest Way Shop.